The Jewish state has seen remarkable diplomatic success in recent years—from the U.S. recognition of Jerusalem as its official capital last year to Israeli sovereignty over the Golan Heights this week, to emerging relations with countries in Africa, Asia and Latin America. For many observers, Israel has gone from a shunned country to a respected member of the international community. 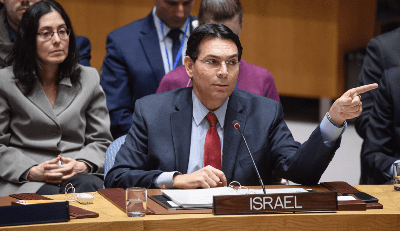 Danny Danon, Permanent Representative of Israel to the U.N., addresses the Security Council meeting on the situation in the Middle East, including the Palestinian question. Credit: UN Photo/Loey Felipe. But there have been other achievements as well—namely, in regards to the work by Israel’s leaders in international bodies, including in the halls of the United Nations. At the centre of this success has been Danny Danon, Israel’s ambassador to the United Nations since 2015. Danon has used his prominent position on the world stage in New York to challenge Israel’s enemies, and combat bias and anti-Semitism, while simultaneously using soft power to highlight Israel’s technological, economic, environmental and social achievements as a solution to global problems. JNS spoke to Danon about his thoughts on his tenure at the international body, the continued challenges Israel faces on the world stage and his view of the upcoming election as well as Israel-Diaspora relations. Q: You have served at the United Nations for nearly four years now. Over that time, what would you say has been the biggest change (for better or worse) you have seen for Israel? A: I think I was able to close the gap between public U.N. to the private U.N. Usually at the U.N., they will speak against Israel publicly, but admire Israel in private. With a lot of hard work and activities, we were able to highlight Israel and Judaism to gain more support publicly. For example, the trip we sponsored taking ambassadors to Poland and Israel. Several ambassadors came and got to experience Israel and become more educated. And we see this support in votes, I became the first Israeli ever to get elected to chair a U.N. committee, and we got 87 countries to support a resolution against [the terror group] Hamas. For me, it was a great personal achievement but came from a lot of hard work. Today, it is a different atmosphere at the U.N. More and more countries publicly acknowledge the importance of Israel to the U.N. and the world. Q: What are some of the biggest challenges Israel faces at the world body today? A: We do still face anti-Semitism and double standards. Today, it is not politically correct to be an anti-Semite, so they are trying to disguise it by speaking against Israel. It is the new form of anti-Semitism and is being pushed by the BDS movement. I don’t accept it when the ambassador of Venezuela compares IDF [Israel Defense Forces] soldiers to the Nazis. Every once in a while, we get a reminder of the hatred that is still there. Q: Despite your efforts, as well as by partners such as the United States, there remains deep-seated hostility towards Israel at the world body. It was especially on display in Geneva this past week at the U.N. Human Rights Council’s gathering and in its recent report on the Gaza protests. What steps do you plan on taking over the next year to erode such behaviour? A: We are continuing to change the course of the U.N. It is an important organization, but it has to focus on the right thing; it needs to change its focus from Israel to other areas around the world. For us, technology is a key player in helping us transform relations. We will use more of our capabilities and know-how to build more bridges with more countries. I also learned that many of the other ambassadors, they care about finding solutions to their own problems. I think we need to help them and focus more on that. Instead of focusing on the [Israeli-Palestinian] conflict and taking sides, we should focus on solving their own problems to the benefit of both sides. Q: Israeli Prime Minister Benjamin Netanyahu has invested considerable time over the last few years to develop ties with non-traditional countries in regions such as Africa, Asia and Latin America. Part of this strategy is an effort to bolster support for Israel in international forums such as the United Nations. Are you seeing the fruits of this labour playing out in greater support for Israel? A: Absolutely. It has been a joint effort with the prime minister and me, meeting with many leaders. In all of our meetings, we not only want to see strong bilateral relations but to transfer this to multilateral relations in the international arena, particularly when it comes to votes at the U.N. or in U.N. organs. You see it all over, countries in Africa or Latin America that used to automatically vote against us—all of the sudden, they are changing their vote, or abstaining or just not showing up. We hope to eventually get them to support us. Q: As we speak, Israel faces considerable threats regarding Iran and its terror proxies, such as Hamas and Hezbollah. You have appealed to the Security Council numerous times on this issue. However, it appears that Iran and its terror proxies are undeterred. What steps do you think the Security Council needs to take to address this threat? A: Hezbollah and Hamas are being funded by Iran. Iran continues to export the revolution, radical ideas and weapons. We have to name them and expose them; we have to designate the terrorist organizations that they are using, Hamas and Hezbollah, as the terrorist organizations and to pass sanctions on them. Unfortunately, the Security Council has not been capable of doing it, not capable of designating those groups as terror organizations. I intend to continue to push for that. We are seeing more and more countries in Europe designating Hezbollah, and I hope the Security Council will do the same. Q: In your recent op-ed for JNS, you write about how American and Israeli Jews have more in common than what sets us apart. Why do you think many so many pundits and community leaders are focused on the negative aspects of the Israel-Diaspora relationship, rather than the positives that you mention? A: I am on the U.N. defending Israel and the Jewish people 24/7. And I think our enemies don’t make a distinction between Orthodox, Conservative and Reform, or left versus right; they attack all of us. When I am outside the U.N. and involved in the Jewish community, people talk about crises and disagreements, but I don’t accept it. I think we have much more that brings us together and unites us; we should be proud of that. Sometimes, some of the leaders focus too much on the things we don’t agree on, and they tend to forget that we have so much in common and at stake. I think we should start with that. Yes, we should not ignore it; we have arguments, and we should end them. But we should not make the arguments the most important thing in the relationship. Q: Furthermore, do you think American Jewish communal organizations are doing enough to bridge the gap in understanding between Israel and the American Jewish community? How do you think we can work to improve the relationship and remain united as a people? A: I think we need to talk and get to know each other. I know Israelis appreciate the support and connection with American Jewry. But sometimes when I speak to people here [in the United States], they are not aware of that. Or they are reading the newspapers about [negative] comments made by one leader in Israel. I think it is important that we speak to one another—then both sides will feel stronger, safer, and it will put everything in perspective. Q: Concerning the United States, I know you were outspoken in your praise for former U.S. Ambassador to the United Nations Nikki Haley and overall for the Trump administration’s support of Israel at the world body. However, Haley’s position has yet to be filled, and her expected replacement, Kelly Craft, does not have much of a record on Israel. Are you concerned that this might mean less engagement from America at the United Nations? A: The sooner the ambassador steps in, the better it is—not only for Israel but for the U.S. and the standing for the U.S. at the U.N. I look forward to working with the new ambassador. We are not worried that there will be any change in policy whatsoever. Q: As for yourself, late last year some reports circulated that you were considering stepping down as ambassador to run in the Likud primaries. What made you stay on? Sometimes in Israel, we have fake news; it wasn’t an accurate report. I decided to stay because it would have been irresponsible for me to leave everything immediately and go back to participate in my party’s primary. I have no doubt I would have been elected in a very high position, but being here, I am aware of the challenges and the things we are dealing with. I decided to complete my term, and I am sure we will have another election in Israel, and I will come back to the government when I finish my term here. Q: Speaking of the April 9 elections, what are your thoughts on the race? A: I am a member of the Likud Party, so you know what my position is on that. However, I am not in the campaign. Personally, it is not easy for me for someone who was involved in politics since age 12 to watch from the sidelines. But Israeli democracy is strong, and I am sure we will have a good government after the election. Q: As I mentioned earlier, you have served at the U.N. for almost four years now. How has your time at the world body shaped your own personal worldview? Do you think you are a different person than when you first arrived? A: I do have the same values, but today I have a better understanding and tools to represent Israel. I know what we need to do to convince leaders to work with other groups. For instance, I recently met with 28 ambassadors of the E.U. [European Union]. I asked to discuss the issue of anti-Semitism and what they can do at the U.N. about it. I have the tools to deal with the things I want to promote and help Israel. But in terms of the core values, I still believe in the same ideals that I first came here with.